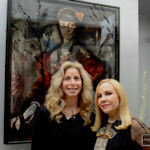 More information and photos on this event at The Art of Ingrid Dee Magidson Blog. Read more about Ingrid's Texas Art. Photos by Roswitha Vogler.